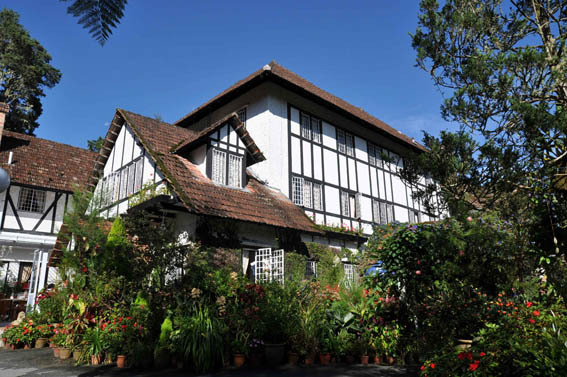 Alli Sharma: I mention Cameron Highlands as an example of mock Tudor architecture projecting British identity abroad. It's an embarrassing, old-fashioned identity that we want to shake off, but one the rest of the world strongly associate with us. Cameron Highlands, coming from a colonial era in Malaysia, I want to say that it would be seen as having some sort of aspirational status. Do you think that is true? Lucy May: I don't think that the mock Tudor architecture of the Camerons is aspirational. If anything, it is probably seen as outdated and a bit uncool, quite the opposite of modern Malaysian sophistication, or 'high-so', as it is called. I think of it in the same way as Classical columns on the better-known Colonial styles of architecture, only it is more charged with meaning for the British because instead of being about power and grandeur, it is about an ideal of home, of a rural idyll, of a simpler past. AS: Is the area just for tourists, or British ex-pats? LM: The Camerons, aside from being a destination for tourists and backpackers, are somewhere that urban Malaysians might go for a weekend break, like Londoners might go to the Cotswolds or the Norfolk Broads. The oddness of it could be summed up by the experience of having a traditional cream tea in The Old Smokehouse, kind of like an afternoon out at a National Trust house but severed from the idea of heritage as we know it. The enjoyment of a quaint nostalgia for something which is not quite real is what appeals. Some southeast Asian friends of mine have an irrational obsession with our Royal Family. They could tell you more than I could about their lives. That seems to be part of the same fantasy idea of Britishness. LM: Most of the buildings are large hotels or apartment blocks, made from concrete and by modern industrial processes. This further removes the mock Tudor styling from its original reference point. AS: What relationship do Malaysian people have with the mock Tudor buildings? LM: The Malaysian relationship to the rural is completely different from the British. The rural ideal is not as significant in their cultural imaginary. It is not uncommon for the word 'countryside' to be used in a derogatory way to signify lack of development or sophistication. The Malaysian rural environment is wet, dense and harsh, not tamed and controlled like much of Britain. It is an anathema to the popular and prevalent ideal of progress in the Capitalist sense. A lot of modern developments have heritage style names, for example The Regency, a huge luxury apartment tower in Penang. The irony is, that the actual Heritage station hotel, a beautiful Colonial building in Kuala Lumpur, is run-down and dingy. One senses that investment in culture and heritage must have some tangible and quick economic return, rather than an investment in long-term cultural benefit for its own sake, which in Britain we have been taking for granted until very recently. AS: Can you tell me about your Malaysian background and how that connects with your artwork? LM: In terms of my own work, I am fascinated by the way that lifestyle signifiers can be interpreted in completely different ways from different cultural perspectives. I have inherited a love of traditional rural Englishness from my Malaysian mother, and an romantic obsession with the Far East form my white British father. Somewhere in the middle, where those things meet, the language of good and bad taste, of the authentic and the ersatz, gets completely scrambled. The idea of cultural snobbery, to me, is therefore absurd, and obsolete in the light of a globalised view of artistic practice. It presumes a cultural superiority, based on a hierarchy, which is no longer relevant. For me, then, it feels exciting to detach things like mock Tudor, or pebble-dash, from their cultural contexts, and deploy them as free-floating devices. Their juxtaposition with unexpected things can reveal ingrained prejudices and allow us to be critical of the ideas of taste and aspiration; to liberate the artist and the viewer from the untenable position of being able to definitively state that something is in 'good' or 'bad' taste.